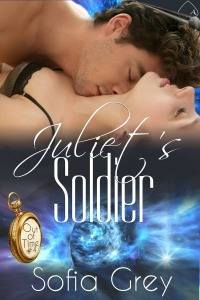 Thank you for requesting a review copy of Juliet’s Soldier. I’ll send your copy on Wednesday 26 July. Juliet broke the first without meaning to. Now, to save the man she loves and undo her mistake, she’ll have to risk her entire future by breaking the second. Juliet’s father wants her to marry for prestige, but she’s less-than-pleased with the partnership he’s arranged for her. To keep her freedom, she convinces Marc to ask for her hand instead. He insists the union is only temporary, but she’s got two weeks of travel with him to the 1990’s to convince him their relationship is more. Then she makes a mistake that not only threatens the timelines of the past, but puts the future at risk too. She’ll have to break the rules to set things straight, and even then, she may lose the man she loves forever.